If it’s not 100% clear from the amount that I write about chocolate, I think cacao and chocolate are truly wonderful foods. I definitely agree with the official name of the plant that chocolate comes from: the plant name theobroma cacao means ‘food of the gods’. This week is also officially Chocolate Week in the UK, so there’s an extra reason to celebrate. As cacao and chocolate come in many forms, they’re really interesting to cook with – as well as eating just as they are of course! They are full of flavour, nutrients and lots of stuff that makes you feel good. To get myself in a true Chocolate Week mood, I’ve been tasting some of the wonderful craft chocolate that I brought back from a recent trip to New York. 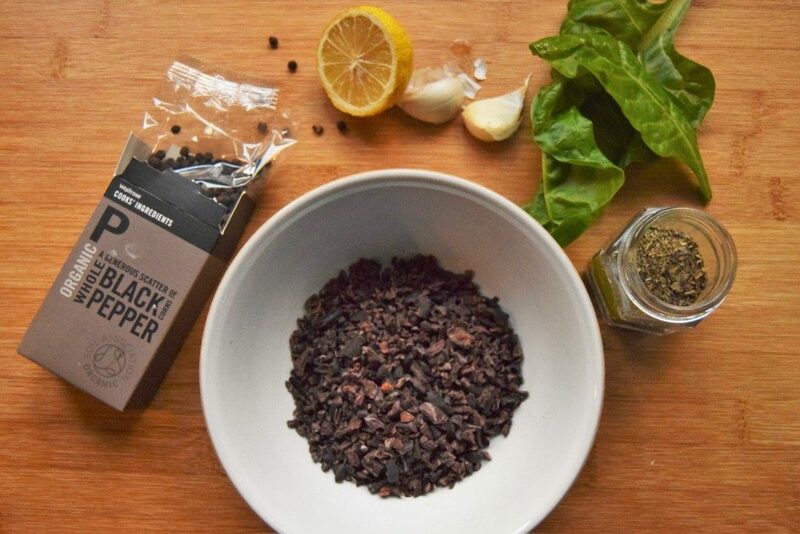 I’ve also been playing around with cacao nibs to make a savoury cacao nib pesto. As mentioned in my last article on the difference between cacao and cocoa powder, cacao beans are the starting point for chocolate. Cacao nibs are the broken up bits of these beans with the skins removed. Cacao powder is the pressed version of the beans with most of the cocoa butter fat removed. You can get hold of cacao nibs in health food shops, online and even in some supermarkets these days. If you want a full antioxidant hit from chocolate, this is what you should look for. But I would never suggest choosing a food just because it happens to be good for you. For me, the taste is very important, as is how you can use ingredients in interesting ways to make delicious dishes. 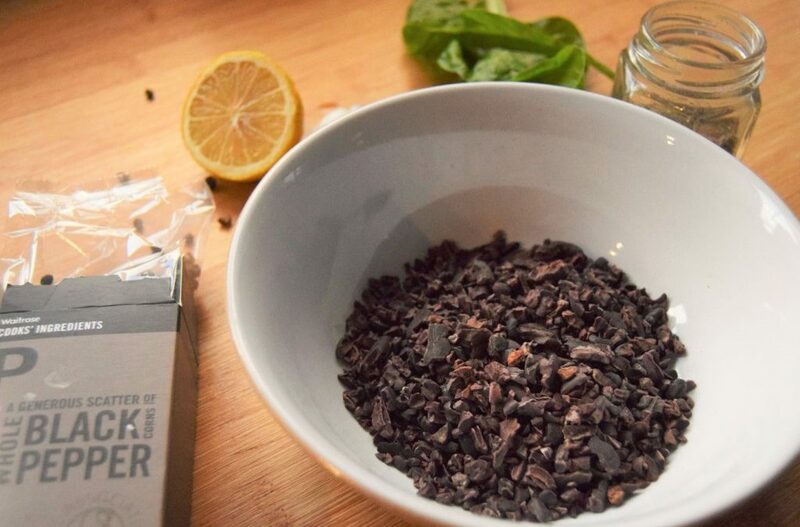 The crunchy little bites of cacao nibs are a mix of bitter and slightly fruity flavours. They smell a bit like chocolate, but don’t taste exactly like it. I like nibs in both savoury and sweet dishes, from breakfast in the morning right through to pudding at the end of the day. I like to eat them straight up too. 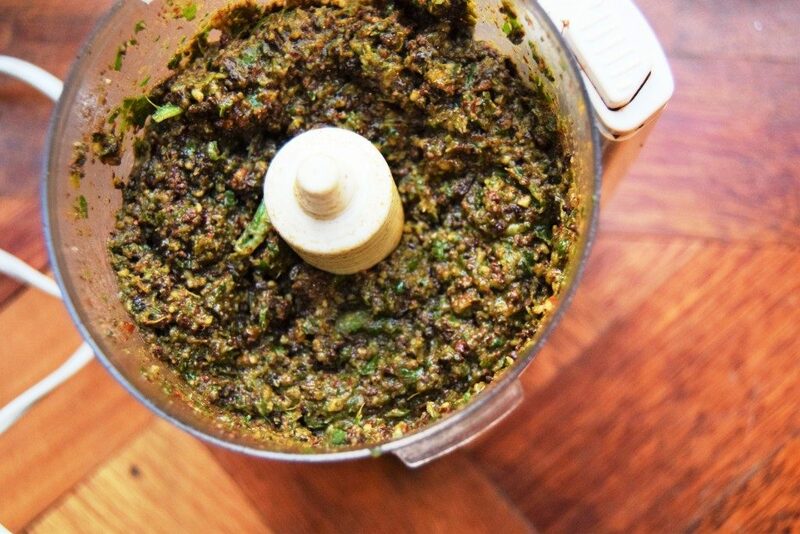 – grind nibs with nuts and herbs to make a pesto (see below!) This is a really simple recipe and you can substitute the herbs and nuts with whatever you have in your cupboard or fridge. One last thing… I really do encourage you to go organic with cacao and chocolate if you can (and ideally Fairtrade). Commercially produced cacao and chocolate can involve the use of lots of pesticides, which is not a sustainable way of growing food in the long term. It can also have a detrimental effect on people working in and living near plantations. In addition, because cacao beans have high fat content (about 50%), they can easily absorb the active ingredients in insecticides. This is one food definitely worth switching to organic if you can. 1. 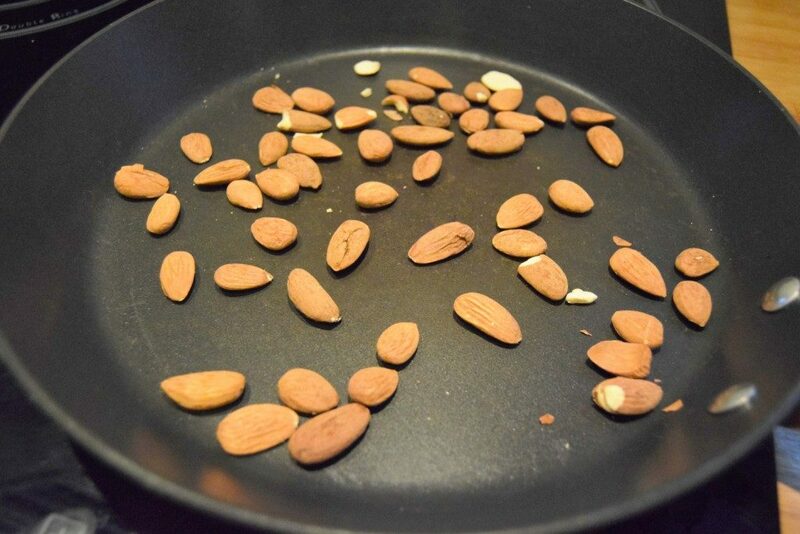 Dry toast the almonds in a frying pan (i.e. heat it up and don’t add any oil) over medium heat for 3-5 minutes. Keep an eye on the almonds and give the pan a shake pan every now and then so the nuts toast evenly (and don’t burn!). 2. 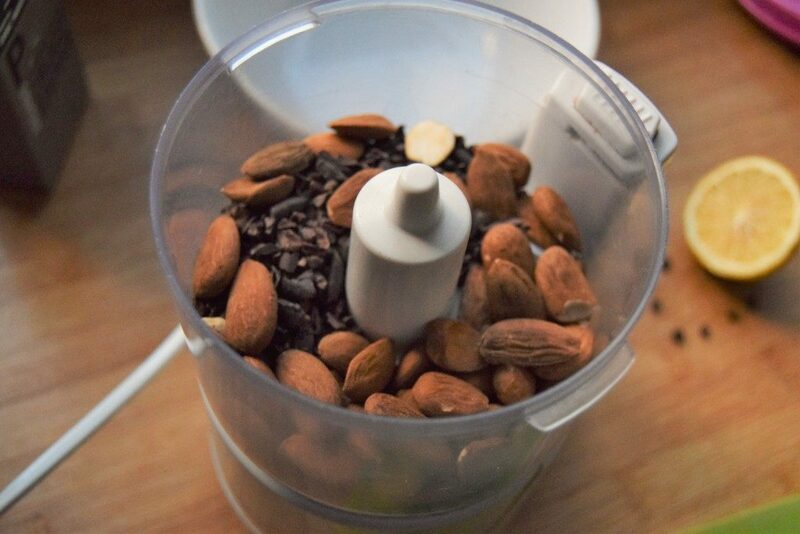 Put the almonds and cacao nibs in a food processor and pulse a few times so that everything is finely chopped. Add the basil, lemon zest, pepper and salt, and blitz for a minute so that everything is ground. 3. Add the remaining ingredients and blend for a few minutes until everything is a paste. You may need to stop a couple of times and wipe down the side of the processor to make sure everything is nicely mixed. If it’s a bit dry add an extra splash of oil. You can use cacao nib pesto pretty much the same way you’d use normal pesto; for example, stir a few tablespoons through some freshly cooked pasta. 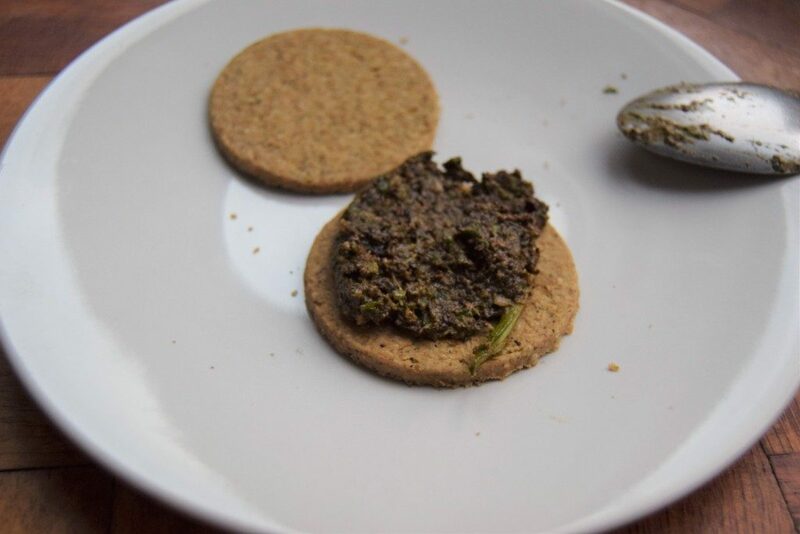 Spread some pesto on oatcakes or crackers for an afternoon snack. It also makes a delicious toast topping with a little mature cheddar or goat’s cheese. Make a dressing for salads by stirring a little pesto into a mix of 2 parts oil to one part lemon juice. One of my favourite things at the moment is savoury yoghurt; top thick greek yoghurt with a couple of spoonfuls of cacao nib pesto, chickpeas and a sprinkle of sumac. This pesto is best eaten fresh, but if you’re not using the pesto right away you can put the mixture into a clean jar, seal and store in the fridge for 2-3 days. If you use the pesto as a spread straight from the fridge you may need to add a little olive oil to loosen the mixture.